Firebrand started as soon as I stepped into Mackenzie House. Surrounded by history and the story of Mackenzie’s political life Firebrand brought life to Toronto’s first Mayor. This is Single Thread Theatre’s third historical play in a series set on location around Toronto. Written by Alex Dualt and set at the end of William Lyon Mackenzie’s life, Firebrand looks at his difficulty with debt, struggles with his home life, and his resignation from politics. Firebrand also briefly touched on some political topics that are still going strong today. The most potent and intriguing to me were the discussions about the Civilization Act, treatment and care of mental health patients, and women’s rights. I am a fan of the unexpected. I tend not to read programmes until after the show, as I entered Mackenzie House, I was handed a colourful short graphic story about the Mackenzie’s coming back to Toronto, this gave context to the play and to his life for any one unfamiliar with his story. My favourite Character was Bell, Mackenzie’s youngest daughter, played by Caroline Toal. Feisty and ever curious, Bell was the hope in the play. She was the one who wanted to take over her father’s political fight. I wanted to know what happened to her. Did she lead the Canadian suffragettes movement? Or did she marry a politician and secretly lead a revolution? With so much historical context before the show, a little note at the end on what happened to here would have been appreciated. 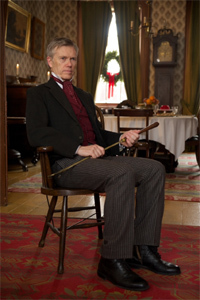 The role of William Lyon Meckenzie was played by Greg Campbell. Campell embodied Mackenzie to a T. In such an intimate venue as a home, every gesture and movement is acutely observed by the audience. Cambell got all the subtleties of Mackenzie’s personality down perfectly. Mackenzie’s fiery passion for his city, politics and family were obvious in Firebrand. Mackenzie House is a cozy historic house, and as such provides an amazing atmosphere perfect for the story unfolding in front of you. Being set in the actual location of the story makes the work feel less like a play and more like we are watching real people living real lives. The only down side of the space is the lack of seating for the audience. After an hour and a half of standing mostly stationary my legs definitely wanted a break. If you are a history buff, or in any way interested in the past and a good story I recommend Firebrand. Tickets are limited because the venue is so cozy, so grabbing a ticket early is a good idea. Firebrand is playing until February 22 at Mackenzie House (82 Bond Street). Shows run Thursday to Saturday at 8pm. Ticket prices are $20, and are available online.